Situated within a spacious 300 square-meter (90 pyeong) secluded enclave housing a zen bamboo garden, the J. Hidden House is a beautiful blend of traditional and modern design which has been hand-crafted and curated in intentionally understated, contemporary minimalism. It is one of the largest hanoks open to the public today within the traditional "sadaemun” (great four gates) inner district of the Chosen dynasty's (1392 - 1897) capital Hanseong (Seoul). From a bespoke 8 meter wet bar set in Italian terrazzo tile, the J. Hidden House offers world-class curated coffees, teas and refreshments, as well as a tailored menu of bakeries and spirits cultivated by Korea’s leading and most cutting-edge food and beverage companies. The establishment is introducing exclusive bakeries made with the high-quality ingredients sourced from around the world, coupled with Korean flavors, such as the “J. Jeju Croissant, a freshly baked croissant, made with the highest-grade French butter and filled with hazelnut chocolate topped with Jeju green tea powder. The seasonally catered coffee beans are supplied by Devastate, one of Korea’s leading coffee roasters known for bespoke tailoring to the upscale, high-end palates of hallyu movie and TV stars and Cheungdam Dong and Hannam The Hill patrons. The visually stunning and healthy fruit and herbal teas are all special recipes made with fresh seasonal fruit of Korea reflecting the peninsula’s four distinct seasons. These include Korean persimmon, pear, melon and Jeju hallabong. A house staple favorite is “J. Lemon Cream Latte,” a marriage of zesty lemon and whole milk cream. For the upcoming winter season, the J. Hidden House’s signature hot menu selection is homemade “J. Daegu Apple Cider” and J. Vin Chaud,” a warm, mulled and 100 percent organic wine cocktail incorporating cinnamon, ginger and citrus that is a staple at Christmas markets all over Europe. 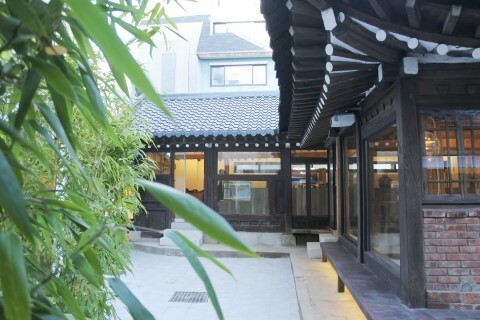 Located in an exclusive “hidden,” but immediately accessible location in downtown Seoul, the destination offers a special passage back in time into a tranquil, spacious serenity despite being centrally situated in Dongdaemun, one of city’s busiest commercial districts and a major tourist destination for shopping and historical site seeing. Outside its doors is Korea’s National Treasure #1 Heungjnjimun (the Great East Gate), Dongdaemun Market and Zaha Hadid designed Dongdaemun Design Plaza. According to the Korea Tourism Organization, visitors to Korea in the first half of 2018 increased by 6.9 percent year on year to 7.22 million tourists. When excluding Chinese visitors, the number of tourists increased 12.2 percent year on year to 5.05 million people, the largest-ever recorded number of inbound tourists to date. The gentrification of central Seoul by aspiring young, hip Korean entrepreneurs who have travelled abroad and understand what today’s well-traveled, global patrons want has boomed in recent years. The neighbourhoods of Ikseon dong, Bukcheon and Seochon have seen a proliferation of speciality craft shops, bakeries, breweries and diverse restaurants over the past three years. The J. Hidden House is now bringing that gentrification trend to the heart of the historic shopping mecca that is Dongdaemun. The J. Hidden House was designed by Design Mori, a boutique design shop credited for helping the meteoric emergence of Ikseon dong hanok village an area that has become immensely popular among global tourists and young locals for its hip shops and unique cafes built into small renovated traditional Korean houses. Prior to J. Hidden House, which is Design Mori's most ambitious and largest project to date, the design firm built Summer, Salon de Bangkok and Simple Tokyo in Ikseon dong. The J. Hidden House is a beautiful blend of traditional and modern design which has been built into the hereditary foundations of a traditional Korean hanok courtyard house over a 100 years old (registered 1915) and is hand-crafted and curated in intentionally understated, contemporary minimalism. It is centrally located in Dongdaemun, one of Seoul busiest commercial districts for shopping and tourism, and is walking distance from Korea’s National Treasure #1 Heunginjimun (the Great East Gate), Dongdaemun Market and Zaha Hadid designed Dongdaemun Design Plaza. Nestled in an exclusive “hidden,” but immediately accessible location just 1 minute walk from exit 10 of Dongdaemun station (Blue, Line 4), the destination offers a special passage back in time into a tranquil, spacious serenity of a traditional Korean courtyard house that has stood the test of time by being walled away since before the Korean War of the 1950s. In a mindful setting the J. Hidden House offers world-class curated coffees, teas and refreshments, as well as a bespoke menu of bakeries and spirits cultivated by Korea’s leading and most cutting-edge food and beverage companies. The J. Hidden House’s culture and values are focused on building community and social responsibility. It partners with and sponsors Junior Achievement in Korea, a NGO focused on developing work-readiness, entrepreneurship and financial literacy skills. A percentage of proceeds are donated to help develop programs for experimental learning and inspire students to dream big and reach their potential.